Portugal has a distinct scene and produces some really good music, that remains out of sight and sort of underground. Basalto it’s as heavy as the volcanic fine-grained rock and just as black. Active since 2015, they just unleashed their second full-length effort, titled ‘Doença’. On this album, arriving only 2 years after their eponymous debut, the band explores new, darker themes. It helps them to create something particularly heavy and dense, with a remarkable amount of feeling in its punch and dark vibes. The trio definitely has that down and creates a sound that is very much their own version of stoner/doom. The ten-minute long opener ‘VII’ is an instant hit, grinding your face through volcanic ash with intriguing rhythms, that never feel like languid stoner passages. A certain jagged aspect makes the beating drive you, always on edge, constantly pushing for something. Listening to Basalto, you instantly detect a need for something primitive in their sound. 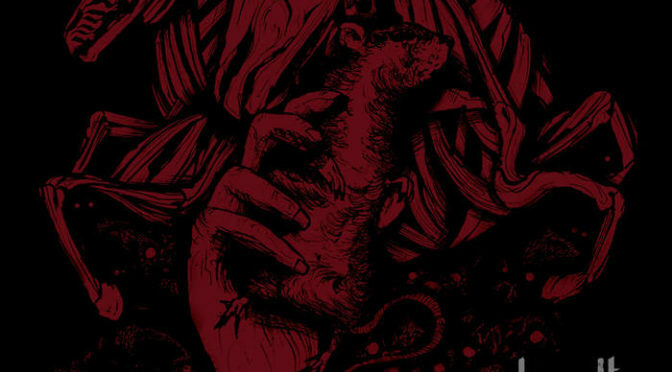 The almost primal pummeling and dark, oppressive atmosphere permeates everything on this record. Accompanying the album is a text by Martin Sousa, titled ‘Doença’, which tells the tale fo darkness in mankind. That is emulated in the sound, on numeral tracks like ‘X’ and ‘XI’, which both carry a sense of foreboding and darkness in their ominous sounding guitar lines and blood-curdling bass lines. It’s as if you listen to a stream of magma, which never goes for the big arches or deep drops, but steadily moves forward. On ‘XII’ however, we get to rock out for a bit, with energetic drumming, funky guitars and a driven bass. The record could use a bit more of that energy, but all in all deeply, dark immersive piece of music.